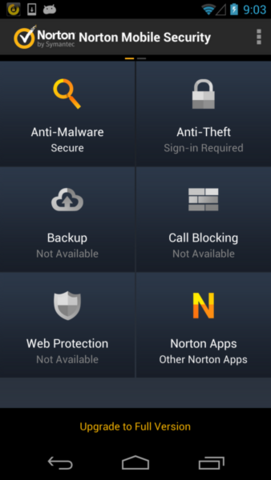 Protection Apps for Android – Feb. 2013. Millions of Android smartphones are currently accessing the Internet without any protection. The experts at the company AV-TEST couldn’t believe their ears when they heard this information. 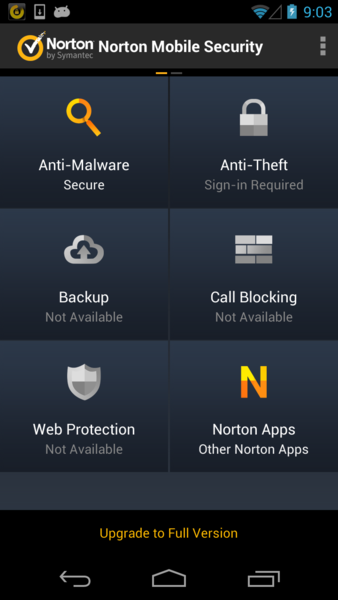 After all, as the latest AV-TEST examination of antivirus apps for Android shows, there are plenty of efficient protection apps available. This Android security app achieved 13 points, the maxi-mum number of points available in the test. At present, over 15 million smartphones in Germany use Android as an operating system. This number does not even include the additional millions of Android tablets that are currently in use. Surveys have shown that every Android device uses at least 20 other apps. Despite this fact, not one of the top 20 most popular smartphone apps is an antivirus app, which is completely incomprehensible given that Android users can choose from a large selection of protection apps, some of which are even free. 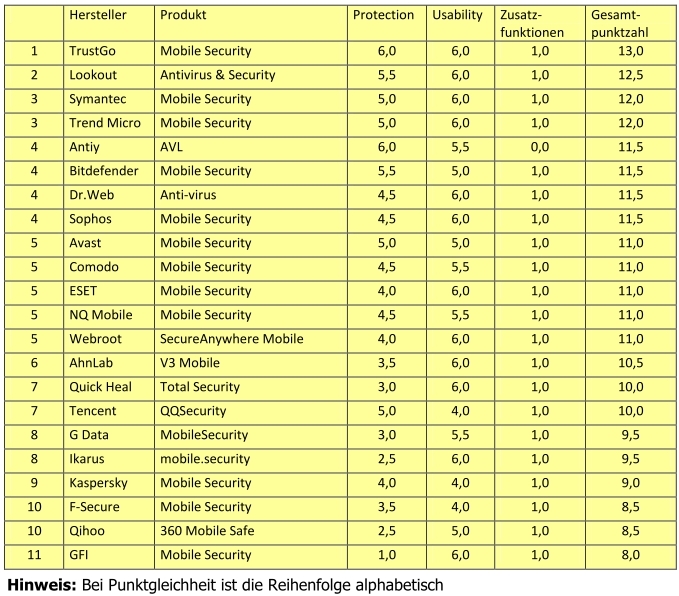 In January 2013, the AV-TEST test laboratory examined 22 antivirus apps that are currently available for Android. All but one of these test candidates were able to achieve excellent results. The good news is that 21 of the 22 antivirus apps tested were so good that they successfully passed the AV-TEST certification procedure for January 2013. Only the app from GFI failed the test and was therefore not awarded a certificate. The maximum number of points available in the test was 13. The antivirus app from TrustGo Mobile Security was the only app that was able to achieve this maximum score. Nevertheless, the next four apps in the overall ranking also scored impressive points totals of between 11.5 and 12.5. A Samsung Galaxy Nexus was used as a test platform for all of the apps in order to provide an equal analysis of their load on the device system. This free app achieved second place in the ranking based on the apps’ overall totals. This security app achieved fifth place in the overall ranking. This app was able to detect 100% of the malware tested. This app produced solid results in all of the test categories. 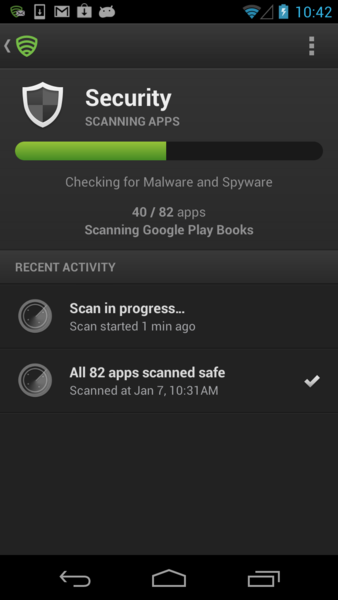 Results of the Test on Antivirus Apps for Android: The Detection Rates of the Protection Apps. 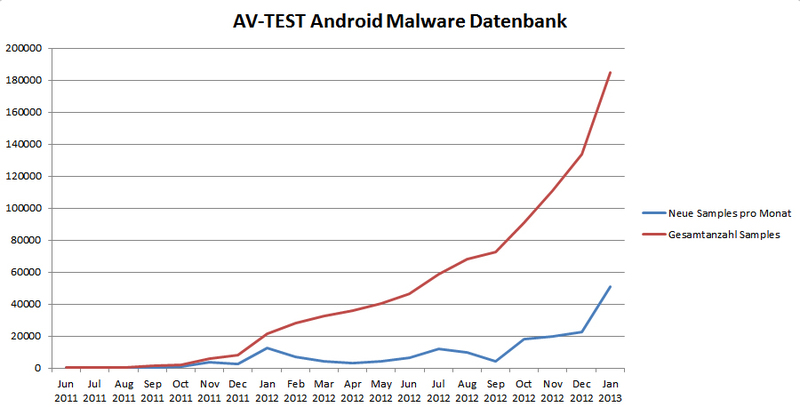 In the first test run on antivirus apps for Android in 2013, the apps’ detection rates were much better than those recorded back in spring 2012. 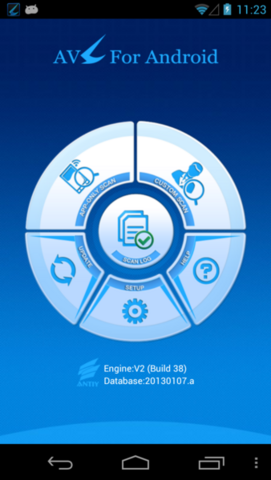 18 of the apps that underwent the latest test achieved detection rates of over 90 percent. The best antivirus apps in this category were those from Antiy, Bitdefender and TrustGo, all of which boasted a detection rate of 100 percent. The amount of malware threatening Android systems is continuing to rapidly increase. In comparison with the total of 100,000 new pieces of malware recorded in 2012 on the whole, an additional 50,000 new attackers have already been identified in January 2013 alone. Results of the Test on Antivirus Apps for Android: The Best Protection Apps for Android According to Their Overall Points Totals. 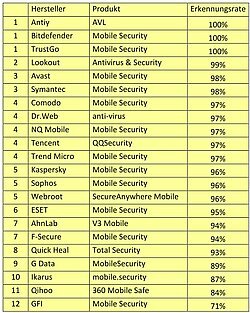 The best Android security app comes from the manufacturer TrustGo, followed by the apps from Lookout and Symantec. TrustGo achieved the maximum number of points available, namely 13, and also boasted the best malware detection result. When the test results are analysed according to the apps’ scores in the category of Protection, an extremely positive development can be identified in comparison with the test carried out on antivirus apps in 2012. In the 2012 test, only 10 apps (of the 41 apps tested) were able to achieve a detection rate of over 90%, while as many as 18 antivirus apps reached this threshold in the year’s test. Only four of the 22 apps tested in 2013 achieved a detection rate of under 90 percent and only the GFI app detected just 71 percent of the malware tested. In comparison, a huge total of 31 apps were only able to achieve detection rates of less than 70 percent in 2012. A large number of the apps tested last year even only detected between 0 and 40 percent of the malware tested and were therefore better classified as ballast for smartphone memories than active tools against malware. The ranking of the apps according to their protective effect is very similar to the ranking based on their overall results in all test categories. The best apps in the test category of Protection were those from Antiy, Bitdefender and TrustGo, all of which boasted a detection rate of 100 percent. The top ten protection apps for Android achieved detection rates of between 97 percent and, in the case of the apps specified above, 100 percent. Given that smartphones and tablets do not exactly boast endless processor performance capabilities, AV-Test also examined the security apps’ load on the Android system. If the strain put on the system is too high, this immediately leads to increased battery consumption. Performance Problems, Battery Drainers or False Alarms? In the test, the apps from Tencent and F-Secure were constantly in action and therefore permanently used up valuable battery power, albeit not a huge amount. The apps from Qihoo and Avast behaved in a similar manner but were more battery friendly. Although the antivirus apps from Lookout, ESET, Kaspersky, McAfee and Webroot always responded in a somewhat unsettled manner, they barely caused any measurable load on the CPU. The other security apps only increased the load on the LPU when in direct use and otherwise remained quiet in the background, at least where their CPU load was concerned. Despite these mixed results in terms of battery consumption and load on the system, all of the antivirus apps performed extremely well when it came to identifying other safe apps. They were able to classify the apps installed on the device as safe without blocking them in all cases other than a few unimportant individual exceptions. 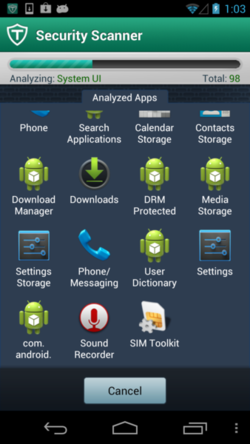 A large number of security apps for Android not only offer users a malware scanner but also a number of other security-related functions. Users often consider the anti-theft feature to be the most important of these additional functions. They can use this feature to remotely block and locate their device and even to completely delete their personal data where necessary. All of the apps tested offered this function with the exception of the app from Antiy. Other available functions include the option of blocking unwanted calls or text messages, a message filter, secure browsing and a child safety feature, as well as backup and encryption features that involve slightly more time and effort. A lot of apps offer different mixtures of the functions mentioned above. None of the apps tested, however, offered all of these additional functions at once. Free Apps or Apps Available to Purchase? All of the apps that underwent the test are at least available as free trials, for example as 14-day test versions with no limitations. 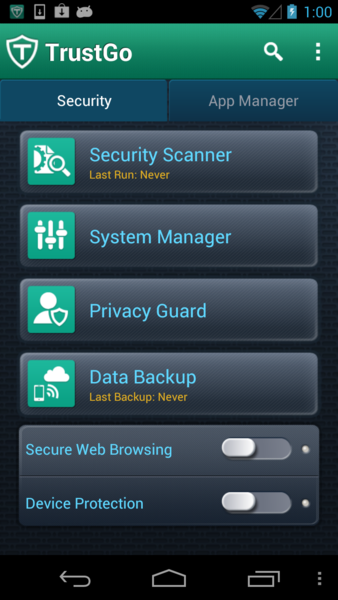 A large number of other security apps are even completely free or free to a certain extent. The second-placed app from Lookout, for example, offers a free protection function and gives users the option of purchasing other special functions for an additional charge. A lot of app providers offer security apps along these lines. One of the most astonishing outcomes of the test is the fact that the first-placed product from TrustGo is completely free for home users. It does, however, only offer a few additional functions alongside the protective function that worked so well in the test. This Android app is fully available in both German and English. Whether the apps are available free of charge or at a price played no role in the overall ranking of the latest AV-TEST test. Although many users could simply laugh off the amount of malware that was causing a threat in 2010, this is no longer a laughing matter. At the end of 2011, the AV-TEST GmbH malware database already recorded a total of over 8000 pieces of malware. Just one month later, in January 2012, this number had increased to a huge total of over 21,000 Android attackers. Now, in January 2013, the amount of malware threatening Android systems has increased nine times over to a total of over 185,000! This development clearly shows that criminals consider the Android system to be a new source of income. At present, the most popular way for these criminals to spread their malware is by offering infected apps. Although the Google Play app store is constantly examined, infected apps are still making their way onto mobile devices time and time again. The second option used by malware criminals is to avoid Google Play and instead offer apps that are available directly from a website. The fact that it is very easy to transfer files and data between PCs and mobile devices means that the infected apps end up on users’ smartphones. The perfidious thing about this approach is the fact that even a Windows system with an Internet security suite is unable to detect the Trojan installed in the app because it is ultimately not malware for Windows. The malware only becomes active once it has been installed in an Android system. If a user has installed a certified antivirus app, this will be able to intercept the malware but in the case of most Android users, who have not installed a protection app, the malware is free to run riot.